The market for controlled release fertilizers in Asia Pacific is witnessing an immense rise, thanks to the growing need for food. The rapidly increasing population in this region has fueled two important needs of humans, food and shelter, which has resulted in less arable land but more people to feed. Farmers and agriculturists are using advanced products and specialty fertilizers such as controlled release fertilizers to heighten crop yields from the limited farming land available across Asia Pacific. They are also focusing on modernizing their farming methods to boost harvest with the help of these fertilizers in order to fulfill the ever-rising demand for food. The market opportunity in controlled release fertilizers in Asia Pacific, which stood at US$1.1 bn in 2014, is projected to rise at a CAGR of 7.20% from 2015 to 2023 and reach US$2.1 bn by the end of 2023. 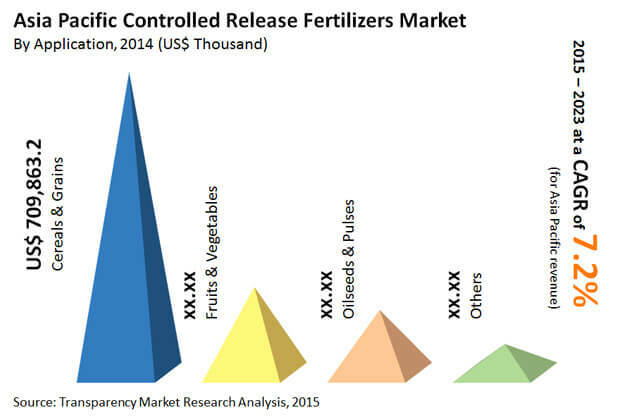 The Asia Pacific controlled release fertilizers market is led by China and India. In 2014, China accounted for the majority share of the overall consumption of controlled release fertilizers and was closely followed by India and Japan. Together, these countries held a share of around 87% of its overall demand in this region that year. Over the coming years, the demand for controlled release fertilizers is expected to increase at a faster rate than conventional fertilizers in these countries. However, the lack of awareness regarding the benefits offered by these fertilizers and their high cost will limit their application in other regions, which is why they are likely to witness a moderate growth in their adoption in the agriculture and the horticulture sectors. Controlled release fertilizers are heavily utilized in the cultivation of oilseeds and pulses, cereals and grains, and fruits and vegetables. These fertilizers are also used to grow turf and ornamental plants. Among these, farmers mostly use these fertilizers in cereals and grain crops. As cereals and grain are one of the most important parts of traditional diets in Asia Pacific – they hold almost two-third share of the overall calorie intake of an average Asian person - local farmers and agriculturists are being encouraged to uptake sustainable agriculture practices in order to increase their production with the efficient usage of specialty fertilizers such as controlled release fertilizers. In 2014, the revenue generated by the application of controlled release fertilizers in cereals and grain attained a value of US$0.7 mn. Rising at a CAGR of 7.40% from 2015 to 2023 it is expected to reach US$1.3 mn by the end of the forecast period. The Asia Pacific market for controlled release fertilizers demonstrates a moderately consolidated structure. ATS Group, Eurochem Agro Gmbh, Shikefeng Chemical Industry Co. Ltd., Kingenta Ecological Engineering Group Co. Ltd., Nufarm Ltd., Central Glass Co. Ltd., Haifa Chemicals Ltd., Compo Gmbh & Co. KG, Hif Tech Marketing Sdn. Bhd., Greenfeed Agro Sdn Bhd, Hanfeng Evergreen Inc., and AgroBridge are the major manufacturers of controlled release fertilizers in Asia Pacific. Controlled release fertilizers are a part of enhanced efficiency fertilizers. They are granulated fertilizers that release nutrients gradually into the soil. Controlled release fertilizers are usually coated or encapsulated with inorganic or organic materials that regulate the rate, pattern, and duration of plant nutrient release. Common polymer materials used for coating are polysulfone (PSF), cellulose acetate (CA), and polyacrylonitrile (PAN). Most controlled release fertilizers are used in agriculture and horticulture applications. Controlled release fertilizers are employed in the cultivation of cereals & grains, oilseeds & pulses, and fruits & vegetables. Furthermore, they are used in the cultivation of turfs, lawns, and ornamental plants. This study analyzes, estimates, and forecasts the controlled release fertilizers market in Asia Pacific in terms of volume (tons) and revenue (US$ thousand) from 2014 to 2023. Market numbers given in the report describe the demand for controlled release fertilizers in Asia Pacific, but not production or supply. The controlled release fertilizers report also analyzes several driving and restraining factors and their impact on the market during the forecast period. The report provides detailed analysis of the controlled release fertilizers by key products and applications. It segments the market into key products that include polymer sulfur coated urea/sulfur coated urea, polymer coated urea, polymer coated NPK fertilizer, and others (including coated micronutrients). It further segments the market into the following key applications: cereals & grains, oilseeds & pulses, fruits & vegetables, and others (turf, ornamental plants, etc.). The report also segments the market based on major countries into China, India, Japan, Australia, Korea, Indonesia, Pakistan, Malaysia, Thailand, the Philippines, Vietnam, Myanmar and Cambodia. It further provides volume and revenue for each application segment for each country. This includes 13 unique country-specific analysis. Based on the application and country, the report analyzes the attractiveness of each segment and country with the help of an attractiveness tool. The study includes value chain analysis, which provides a better understanding of key players in the supply chain from raw material manufacturers to end-users. Additionally, the study analyzes market competition through Porter’s Five Forces Analysis. The report includes an overview of the market share of key companies in the controlled release fertilizers market in Asia Pacific. Market share of companies has been derived on the basis of production by manufacturers of controlled release fertilizers. Key market players profiled in the study include Shikefeng Chemical Industry, ATS Group, AgroBridge (Malaysia), Greenfeed Agro Sdn Bhd, Haifa Chemicals Ltd, Nufarm Ltd, HIF TECH SDN. BHD, Eurochem Agro Gmbh, Compo GMBH & Co. KG, Kingenta Ecological Engineering Group Co., Ltd, and Central Glass Co Ltd. Profiles of key participants comprise important parameters such as company overview, financial overview, business strategy, and recent developments. Primary research represents the majority of our research efforts, supplemented by extensive secondary research. We reviewed key players’ product literature, annual reports, press releases, and relevant documents for competitive analysis and market understanding. Secondary research also includes a search of technical writing, recent trade, Internet sources, and statistical data from government websites, trade associations, and agencies. This has proven to be the most reliable, effective, and fruitful approach for procuring precise market data, recognizing business opportunities, and understanding industry participants’ perceptions. Secondary research sources that are typically referred to include broker reports, corporation websites, external patented databases, financial reports, stockholder presentations, Securities & Exchange Commission filings, proprietary databases and relevant patent and regulatory databases, national government documents, statistical databases, and market reports, news articles, press releases, and webcasts specific to companies operating in the market. Secondary sources referred for this study include Chemical Week Magazine, ICIS Chemical Business Magazine, Hoover’s, Factiva, and company presentations.